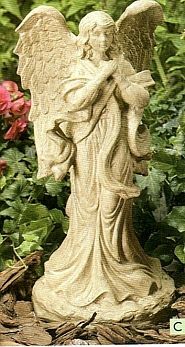 Our garden angels includes this lovely praying angel statue for the garden. She is shown with hands in prayer and comes in many available garden finishes. Made of resin with marble aggregates. Dimensions: 17" x 8" x 8". Delivery: Normally ships in 2-3 weeks.